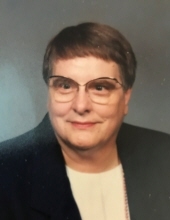 Joyce M. Stoops, 86, of Forest Park. Beloved daughter of the late Fred and Myrtle Stoops. Loving sister of Marlene F. Stoops. Joyce was an RN MSN and a longtime nursing leader at Rush Presbyterian-St. Luke's Medical Center in Chicago. Ms. Stoops was , for decades, a member of the Chicago Temple, First United Methodist Church Chicago. She will be missed by many cousins, neighbors and friends and all who had the pleasure of knowing her. Interment Covington Memorial Gardens in Fort Wayne, IN. Info. 708-366-2200 or www.ZimmermanHarnett.com. To send flowers or a remembrance gift to the family of Joyce M. Stoops, please visit our Tribute Store. "Email Address" would like to share the life celebration of Joyce M. Stoops. Click on the "link" to go to share a favorite memory or leave a condolence message for the family.